Accessing your personal email/social media accounts on a public computer can sometimes be dangerous if you’re not careful or forget to log out completely. Sometimes your greasy fingers also leave fingerprints on keyboards which can be used to crack your passwords, not to mention security camera which are now present everywhere and can be used to stealthily film you while entering those letters. Facebook has just introduced a new security measure to take care of the potential hazards of accessing your account from a public computer: disposable passwords; use once and forget. Users just require to text “opt” to 32665 from their mobiles which require to be linked with their Facebook account and they’ll immediately receive a temporary password which they can use once while accessing a public computer. The password will automatically expire in 20 minutes and won’t be of any use even if someone finds it out or you accidently save it on Firefox. 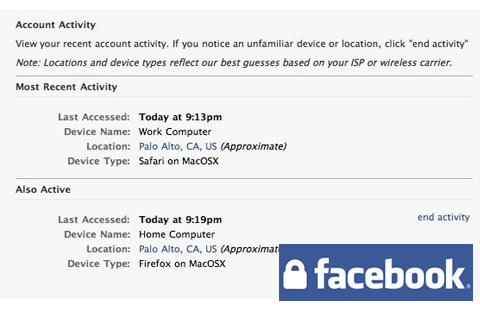 Facebook also introduced a remote log out feature recently which also tracks your account activity and lets you know if your account is accessed without authorisation. This feature will surely come in handy for frequent travellers who stay in different hotels several times a month and spend a lot of time at airports and access their Facebook accounts from public machines.